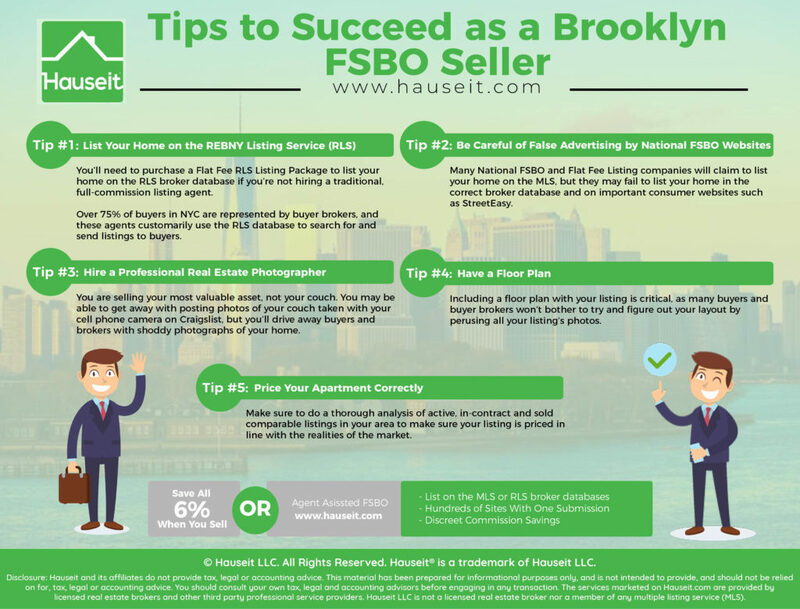 As a traditional Brooklyn FSBO seller you will face many challenges in receiving full buyer exposure for your home listing. Not only will you experience harassment and solicitation from junior agents without buyers, but you’ll also face confusion on which inter-brokerage database to list your property on should you want to engage the 90% of buyers who are represented by agents through a “flat fee MLS” listing. You’ll need to purchase a flat fee listing package that ensures you will get on the relevant inter-brokerage database for your area. This is important because offering a commission in your local inter-broker database will attract the attention of the 90% of buyers who are represented by agents. Keep in mind that New York City does not have a single, dominant MLS (Multiple Listing Service) like most regions of the United States. The equivalent of the MLS in NYC is an inter-brokerage shared listings database run by the Real Estate Board of New York (REBNY) called the RLS. Be careful of “national” for sale by owner websites claiming to cover all 50 states promising to list you on your local MLS. These are generally irrelevant for New York City and Brooklyn FSBO Sellers because they will indeed list you on MLS, just not one that is relevant for you. 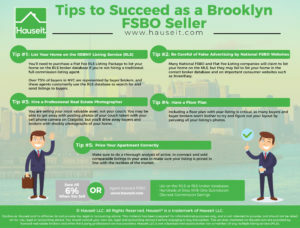 Brooklyn FSBO sellers can easily spend up to $1,000 on these flat fee MLS listing packages which will result in no difference in traffic versus listing it only on Zillow for free. Why? Because these “national” for sale by owner websites will put you on a MLS when NYC doesn’t have a dominant or even relevant MLS. Expect to be listed on the New York State MLS, Long Island MLS or if you’re lucky the Manhattan MLS. None of these are very relevant for NYC because of their small membership bases and small number of listings in NYC and the fact that the bigger NYC brokerages have opted out of membership. Moreover, these “national” FSBO websites will not list you in StreetEasy which is currently the most popular consumer real estate search website in NYC. As a result, for the cost of up to $1,000 you will be listed in a MLS that’s irrelevant to NYC and still have to pay $399 if you wanted to list FSBO on StreetEasy for 28 days. As a result, you might as well have listed FSBO on Zillow and Trulia for free. You are selling your most valuable asset, not your couch. You may be able to get away with posting photos of your couch taken with your cell phone camera on Craigslist, but you’ll drive away buyers and brokers with shoddy photographs of your home. Especially if you’re selling via a traditional FSBO, your cheap photos will reinforce the negative stereotype of FSBO home sellers being extremely cheap and thus highly unlikely to offer and/or honor any sort of commission to a buyer’s agent. This isn’t a good thing because 90% of all home buyers in NYC are represented by agents. First impressions are extremely important because each view of your listing is extremely valuable. Every impression of your listing online could be a potential buyer of your home above asking price. Do you really want to turn them away with amateur photographs? Moreover, the buyers you will attract to your listing with shoddy home photos will be vulture investors looking to negotiate a discounted deal with an off-market listing (that’s you by the way traditional Brooklyn FSBO sellers). You want to present your home in the best possible light. Period. Have you done renovations since you purchased the apartment? Do you have permission to use the previous listing agent and owner’s floor plan online? Even if you have permissions, was it ever accurate? It’s important to present a floor plan to potential buyers online. It’s a commonly cited statistic that half of all home buyers will not bother to visit a property without first seeing a floor plan. As a result, it’s important to have a new one drawn by a professional architect or draftsman as it’s unlikely that the previous listing agent will agree to just let you use it for free. That listing agent is probably bitter that you didn’t choose her to represent you on your sale, so why have that conversation? Where can I find the square footage to my apartment? It’s important to know that square footage for condominiums can be found in the original offering plan as well as NYC Department of Finance website. Property tax bills are posted publicly by the NYC Department of Finance and can be found by looking up a unit’s address or the BBL (Borough – Block – Lot) number. Finding the square footage for a co-operative is trickier and less uniform. Since co-op’s are not classified as real property, but rather shareholder ownership in a corporation that owns the building, only the tax bill for the entire building is listed on the NYC Department of Finance website. As a result, most listing agents have traditionally not posted square footage on co-op listings primarily to be able to give vague, verbal estimates which they cannot be held accountable to. Watch out for these verbal estimates which can sometimes be 10-20% larger than the unit really is. The original offering plan of some co-op’s will have square footage records for each individual unit. As a seller, you will want to ask your building’s managing agent or your real estate attorney who helped you purchase the unit originally for this important offering document. As a buyer, you will have to ask the listing agent to send you this once you have demonstrated some level of seriousness in purchasing the property. As the CEO of the largest NYC brokerage recently admitted at a REBNY Member conference, any unit that is priced correctly will sell regardless of who is listing it. Therefore, make sure to do a thorough analysis of active, in-contract and sold comparable listings in your area to make sure your listing is priced in-line or preferably below your peers. 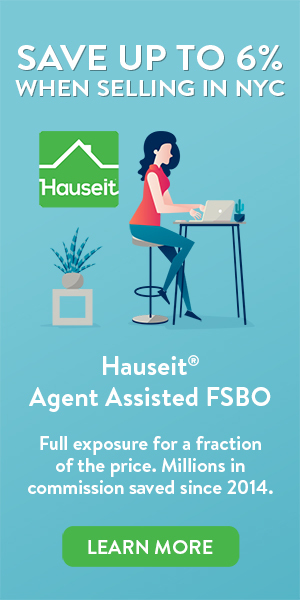 Keep in mind that as an Agent Assisted FSBO customer, you have the luxury of underpricing your property without ever being forced to accept any offer and pay a commission to your listing broker. As a result of this huge advantage, you can underprice your property to attract more inquiry and time investment from potential buyers, thus increasing your chances of creating a bidding war from multiple interested parties. If you’ve followed all of these tips then you’ll know that your home is getting the maximum possible exposure to all potential buyers. This will help you stay strong against the occasional unethical broker who tries to solicit you in person to try to break your confidence so you will list with them. Just remember, most of their lies are infantile and completely transparent. You are a home owner in the most desirable and exclusive metropolis in the world. There’s no way you will get conned by a real estate agent with barely a High School education! 1Not all exclusive listing agreements will have this type of language. Real estate contracts are negotiable, just as broker commissions are negotiable. Learn more in our article on can a seller back out of an accepted offer in NYC.